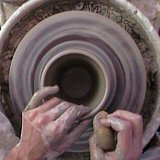 Learn how to use, build or buy a pottery kick wheel for sale. Plan for your kick wheel design idea. Learn about a brent kick wheel kit. Finally, learn about different kick wheels and find tips on how to build or buy one. The kick wheel's beauty is it's simplicity. It consists of two wheels connected by a rod, attached to a frame. It's completely human powered so it requires no motor or electricity. Using one is pretty simple, too. 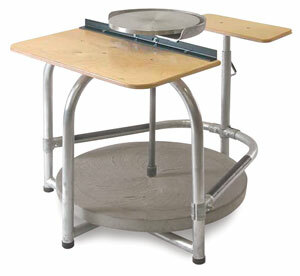 You sit on a raised seat and push a fly wheel with your foot. After several kicks, the wheel gains momentum and keeps the smaller wheel head spinning for a minute or two. When the wheel slows down, you kick the fly wheel again to keep it going. Note: Some kick wheels come with a motor attachment too, so you can use them with electricity. The great thing about them is the level of control you have. You can spin the wheel either direction. You can also go as fast or as slow as you like. The drawback is their size. 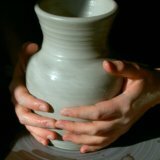 They're generally bulkier and heavier than an electric pottery wheel. 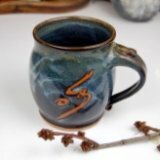 Interested in building a kick wheel? It's relatively easy to do. 80% of it can be built by hand. Most people will purchase the wheel head and connection rod in a kit. Most of these kits include a quality wheel head and ball bearings which keeps the wheel spinning faster and more smoothly. 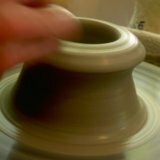 When I was just getting started in pottery, I helped a friend build a kick wheel. We used mostly leftover wood from his garage and poured a fly wheel using concrete. I threw a lot of pots on that wheel and it worked well for us. There are also a variety of models that you can purchase new, or you can purchase a Brent kick wheel kit. You can also purchase wheels like the Skutt Thomas Stuart Kick Wheel pictured above at Blick Art Materials . Whichever route you choose to acquire your wheel, good luck and Happy Potting.